Moo0 Video Info is a free software for Windows that helps you to get video info in detail such as codecs used in video, frame rate of video, its picture size, audio video bit rate, metadata information, and more. Thus it provides a detailed information about almost all popular formats such as vob, flv, avi, mkv, tp, ts, mpg, rmvb and more. Unlike its name, it is capable to gather information about audio files too. 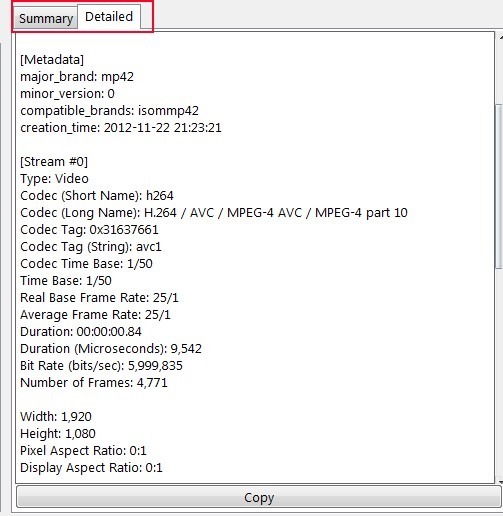 Thus it is a useful software to view details of media files. Although you can get the details of media files by right-clicking and accessing their properties also. 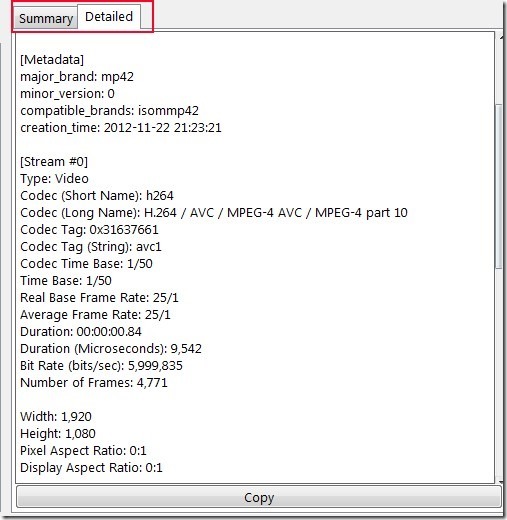 But it doesn’t show whole information such as metadata information, used codec, codec tag etc. That is where this software comes handy. Using this software is so easy as you only need to drag n drop media file whose information you want to see. Immediately it will show you summary as well as detailed information of that file which you can copy also. Moo0 Video Info is free for personal use and you can run it on Windows. Below you can see interface of Moo0 Video Info where you can drop any media file to get its detailed information. It will provide you details such as filename and its total size, container (showing you format, duration, bit rate and metadata of that file), video and audio details. You can copy each detail separately using Summary tab or can copy whole information altogether using Detailed tab. It is a simple but effective software which lets you explore core details of a media file which is not possible just by accessing properties of that file. Lets you view detailed information of videos as well as audio files. No mouse click is needed to get video info or audio info. Simple drag n drop action is required. You can copy each and every detail with the help of Copy button. Shows separate sections containing different details. Free of cost available for personal use. 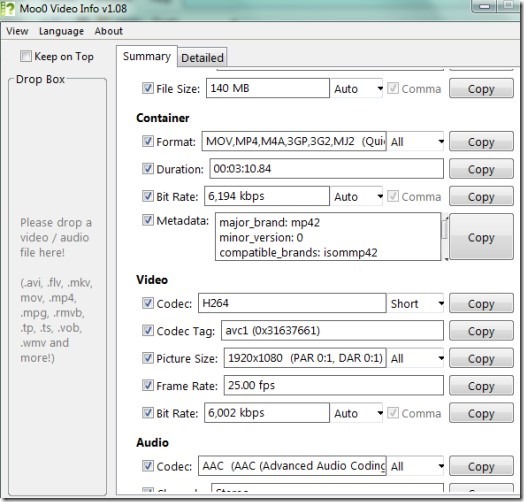 Moo0 Video Info is lightweight software and its total size is 8.80 MB. So it won’t take much time to download it. You can use the link present at the end of this article to download it. 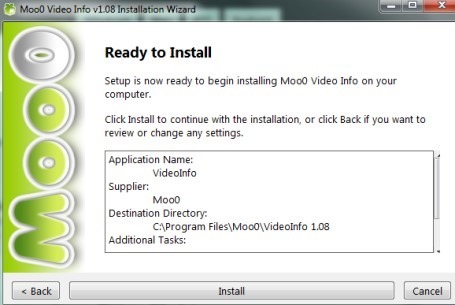 After downloading it, simply run its setup file and follow simple steps of installation process. Other products of Moo0 we reviewed earlier are: Moo0 Video To Audio, Moo0 Windows Menu Plus and Moo0 Video Cutter. 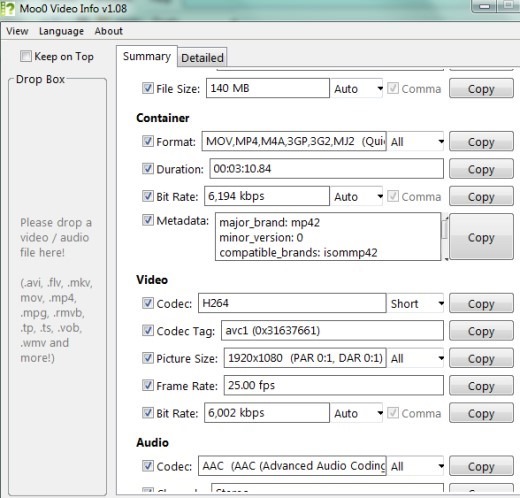 Get Moo0 Video Info free of cost. You may also try MediaInfo and MediaInfo Lite for free to get media files information.